If you’re preparing for discharge from hospital, you’ll need to arrange a care needs assessment, and then ensure you’ve got the right care package in place. Discharge from hospital can be a much anticipated moment, but some people may feel anxious as hospital discharge approaches. Who will look after me once I leave hospital? What if I struggle to prepare meals, do my shopping or take medication on time? It’s completely natural to feel a bit worried about how life will be once you’ve been discharged from hospital. Knowing that the right type of care package awaits you once you leave hospital can help alleviate these concerns. If you’re ready to compare care homes and evaluate domiciliary providers, we can help. But if you’re still navigating the NHS hospital discharge policy, read on. So, what is the NHS hospital discharge policy? Each hospital has its own discharge policy. (See note 1.) You can get a copy of your hospital’s discharge policy via the Patient Advice and Liaison Service, or PALS. You can also phone NHS 111 to request information on contacting PALS. A minimal discharge means you’ll need little or no care. A complex discharge indicates you’ll need complex care post-discharge. If your discharge assessment reveals that you have ongoing care needs, you will need to receive a care needs assessment. This will identify the full scope of health and social care needs to be supported, and how to best manage them outside of hospital. To initiate the care needs assessment, you should speak with a hospital nurse, a social worker, your GP or an allied health professional. These people can help you get a hospital discharge referral. Discharging older patients from hospital: do you qualify for NHS Continuing Healthcare? A key worker, such as a hospital nurse, will manage the discharge process. 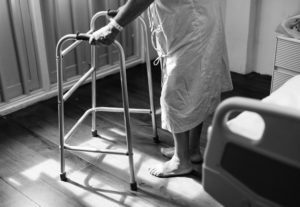 Can you refuse to be discharged from hospital? If you sense reluctance about leaving hospital, have a chat with your friend or relative to understand the reasons that may be fuelling this reluctance. Listen carefully. Repeat what your relative has said, to ensure you’ve captured each concern. Reassure your relative that his or her perspectives and thoughts are valid. Once you understand your relative’s priorities, it’s time to evaluate and compare care options. When possible, suggest a range of options that could provide flexible care to support your relative’s lifestyle preferences. Can care be provided at home? If care needs are more complex, would live-in care allow your relative to remain at home? Overnight care may be a complementary option worth exploring. In ideal circumstances, the person requiring care gets to pick his or her preferred care package. But what if care package choices are limited? Or what if your relative remains opposed to receiving care? Try to remain patient, continue to listen and offer comfort. Ultimately, safety and wellbeing must keep their place as priorities on the care journey. And unfortunately, it’s not always possible for you to be the main person who ensures the safety and wellbeing of your relative on a day-to-day basis. If you are struggling to reach an agreement about the best care package to support your relative’s needs, seek advice on how to broach the subject of care.